What Are Crypto Banks and How Can They Change the Financial Industry? Blockchain technology is coming up strongly as the technology of the future. Its continuous evolution illustrates this from underpinning Bitcoin, being a buzzword, to developing real-life use cases. The financial sector is one of the key areas that is expected to see Blockchain usage flourish. So far, cryptocurrencies have seen to it that it is no longer business as usual for finance. The change in how people conduct global monetary transactions in cryptocurrency cannot be ignored. Be it a simple user who needs an easy tool for money transfer, payment for goods and services, or a crowdsource project funding through ICOs; blockchain is rapidly being integrated into our day-to-day financial interactions. Crypto banking is an important player in restructuring within the broader scale of the financial industry. It comes as an improvement of centralized traditional banking systems. Being decentralized platforms, they offer services similar to those of traditional banks except they are more transparent, secure, trustworthy and less bureaucratic – thus more efficient and faster. Cryptocurrencies are a virtual medium of exchange. They do not have physical forms, and all their transactions take place online. Users generally store them in crypto wallets which act as banks. Crypto exchanges also offer storage services where users choose to either keep their assets on exchange accounts or other preferred wallets. With this as a rough idea on how ownership of assets is established and secured, crypto banks can be defined as sophisticated exchanges or wallets. 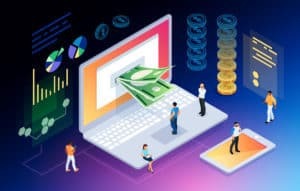 Bearing focus on a variety of services such as; inbuilt exchanges, payment gateways, credit services, open source networks, personal and business accounts, crypto banks bring to life global internet-based banking facilities. Crypto banks draw their power from the use of blockchain technology. They employ blockchain to enable Peer-to-Peer (P2P) transactions and use of smart contracts to execute terms set out in contracts. As a result, transactions are automated at increased speeds and lower costs. All services within a crypto bank ecosystem enjoy convenience originating from the attractive inherent blockchain capabilities centering on transparency, privacy, and security. Credit facilities, for instance, are managed through decentralization by directly linking borrower and user. This is a reliable option that ensures borrowers have a better chance of getting loans quickly as long as they have a good credit rating. Unlike traditional banks, the direct linking cuts out intermediaries and long processes to execute services within the shortest timelines possible. For loans, they are generally processed within 24 hours. They also do not have the inconvenience of ‘business days and hours’ which limits transactions within specific times. To create friendly and user-oriented loaning services, crypto banks use Artificial Intelligence (AI) to come up with reliable rating systems. Borrower’s information is structured and analyzed using AI to create detailed assessments of loaning risk involved. By crypto banks involving tools of accuracy and precision in their loaning, the crypto banking system becomes less vulnerable to bankruptcy. This approach becomes a multifaceted structure favorable to both borrower and lender. Borrowers are protected from bias seen with human involvement in conventional banking, whereas lenders are cushioned from bad debtors. Crypto banking projects are gradually entering the market, and today crypto users can choose from a variety of crypto banks. As can be seen, crypto users can begin feeling comfortable from the competitive development in the crypto banking space as it sets a healthy direction for growth. Among the many is Galaxy Digital LP founded by billionaire and former Wall Street fund manager Mike Novogratz. It is a ‘diversified merchant bank dedicated to the digital assets and Blockchain technology industry with a multi-disciplinary team that has experience in investing, portfolio management, capital markets, operations, and Blockchain technology.’ Galaxy Digital, however, is not involved in issuing crypto loans. As enumerated in its team experience, it is focused on crypto investments, consulting and trading. Datarius is another notable crypto-bank. In contrast with Galaxy Digital, it is more focused on offering credit services. Datarius looks to offer the ‘widest possible instruments’ in instant transfer systems integration among them Money Gram, Transferwise and Western Union. It has a rewards system in ‘fees for activities, earning possibility roles, programs and commission back.’ The company raised $1.6 million in its Initial Token Offering (ITO) and is set to make inwards towards its goal of ‘demonstrating that Fintech can be completely different.’ The crypto bank also does not impose services on users. It has a three listing model for users which categorizes them under trust levels; Trust Limit, Trust Management and User ratings. With this model, users have the freedom to choose their terms and costs. Foton bank, taking the same direction as Datarius, seeks to become a ‘financial ecosystem of the future’ with credit issuance being a significant service. Its other groundbreaking features are payments through contactless payments and the development of blockchain technology. Foton envisions a complete revolution in the world of banking through its multi-currency transactions with a built-in fiat and сryptocurrency exchange. Its interbank ecosystem is powered by its light in-house blockchain technology that combines customer services processes and finance. Through its ecosystem, Foton can establish and manage various social institutions through their decentralized registry. Importantly, it provides a simple and understandable crypto tool with minimum fees and secure transactions through smart contracts. Revolut sales itself as a ‘Radically Better Account’ with services comprised of; current account, built-in budgeting, insurance, global money transfer, and a Crypto exchange. It offers transactions in up-to 150 currencies in fiat and Crypto whereby its interbank exchange rate is 0.5% of anything above 5,000 Pound Sterling. This is comparable to Foton’s 0.5% charge on the total payment amount. The bank recently secured a European Banking license and will be expanding from the UK to Asia and America. In Malta, a blockchain-based financial organization aptly named Founders Bank is being developed. The bank will be owned by token shareholders thus making it a public-owned bank. Binance founder Changpeng Zhao is one of the notable investors in the Founders Bank project. It is also worth noting that the Government of Malta supports the idea of creating such a decentralized bank. If people could keep long records over time, ensure all numbers add up and be sure they could trust each other completely when entering into transactions, they would not need banks. Banks have become a necessary evil; they are expensive, take away user control on their funds, are subject to bankruptcy and vulnerable to gross intended or accidental human errors. Crypto banking flips the coin and brings to play a host of attractive financial features that can drive crypto banks to gain a strong footing over traditional banks. First, decentralization cuts out intermediaries and involvement of unnecessary long chains of people. By easing out on processes and the number of persons involved, сrypto banking systems become faster and cheaper. Technically, they allow users to access banking facilities while ‘not’ banking if the traditional definition of banking is anything to go by. Crypto bank loans are also better with public credit scores which ensure there is no bias in their issuance. Also, loans are offered in the network’s native coin which strengthens the system by creating a demand for a given token. Many blockchain startups fail as they do not have much use for the coins they offer to raise funding. Taking advantage of this, crypto banks can turn the lending sphere to adopt P2P lending which is faster and more reliable. Removal of the concentration of management in the banking sector from the hands of a few and giving power to the public could lead to a global community of shareholder. With this set of better options, crypto banks stand a better chance of becoming an alternative to traditional banking in the financial industry. However, this is not going to be outright easy. It is a long-haul whereby structures need to develop to guarantee positive growth. Currently, cryptocurrencies do not have the desired standing with institutional investors and funding. Some have not entirely understood the technology or are dissuaded by the industry shortcomings in uncertain regulations as well as volatile crypto prices. Also, crypto banking has received aggressive resistance and opposition from established traditional entities that consider cryptocurrencies and their resultant technology be a threat to their businesses. As earlier discussed, blockchain forms the backbone for crypto banking. However, financial institutions are not the only entities adopting blockchain. Blockchain is seen across the board and seems to fit into almost everything. With the understanding that blockchain is being vigorously adopted in various other industries, banking cannot be left behind in the revolution process. What Are Crypto Banks and How Can They Change the Financial Industry? was originally found on [blokt] – Blockchain, Bitcoin & Cryptocurrency News.